During a period of roughly 100 years (1778 to 1871), Indian nations ceded the vast majority of their lands to the U.S. government through treaties. 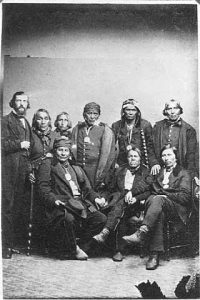 Treaties became the “supreme law of the land,” providing legally-based government-to-government agreements meant to guarantee the Indian nation’s retention of certain rights and privileges, such as land use and occupation. 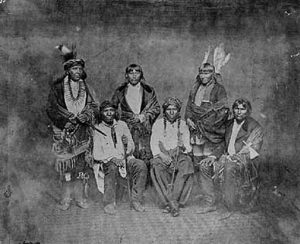 Unfortunately, many of the lands guaranteed to Indian nations were illegally taken after the fact (the Black Hills is one example) and remain out of Indian ownership and control today. The Treaty Signers Project examines how business interests in land speculation, railroads, the fur trade, mining, forestry and other pursuits heavily influenced the treaty making process and were largely responsible for the loss of so much Indian land. The “American Myth” presents “pioneers” as the driving force of America’s past. By contrast, the Treaty Signers Project presents the economic engines that actually drove U.S. expansion – interests that saw both Indian land and pioneers as sources of personal profit. The 2,600 men who represented the U.S. in treaty negotiations secured hundreds of millions of acres of land for themselves, their families and their business partners – land that was sold to pioneers at a profit and includes the original sites for hundreds of cities and towns. ILTF’s Treaty Signers Project is helping researchers make sense of the vast amount of scattered information on these critical events. This innovative project will foster real discussion about our history as it actually was, not the idealized legends of westward expansion America celebrates today. Watch for more information on the Treaty Signers Project in the months ahead.